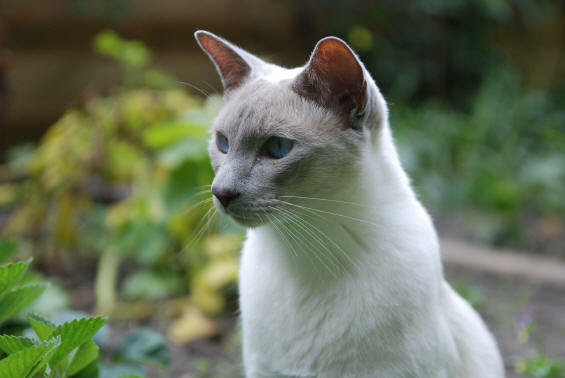 The breed description we want to use in Holland is based on the "PREOSSIA" breedstandard (U.S.A.), the Thai standard of the" World Cat Federation" and "Nederlands Overleg Keurmeestersgilde" (standard Siamese and eastern Shorthair). The ideal traditional Siamese is a medium sized, staunch cat of robust type, lithe and graceful. Good muscular development, round bone structure, possessing a solid look along with balance and proportion. Solid appearance with good width in bone structure from chest to buttock, giving the appearance of well developed shoulders, chest and hindquarters. Back broad with a sligh t curve. Viewed in profile, slight curve down from the point of croup to base of tail. Legs well muscled, proportionate in length and bone to the body. Paws are more round than oval. Tail is medium in length but in proportion to the body, slightly broader at the base, tapering and straight. Coat is short, thick enough to have body, satiny and somewhat close-lying but not tight or flat. Plush and soft in texture, undercoat is unwished. Body color is even. Subtle shading, if any, should be darker across the shoulders and back, fading gradually to lighter color on stomach and chest. 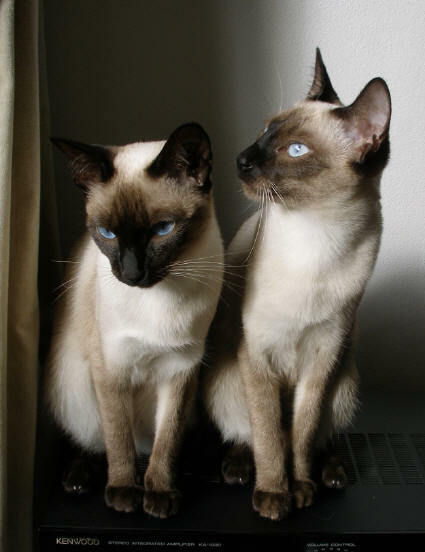 Allowance to be made for darker body color in older cats as Siamese generally darken with age, but there must be a definite contrast between body color and points. Chin , mask, ears, legs, feet, tail are a rich, even color that is darker than and in distinct contrast to the remainder of the body. Mask must cover the entire face including whisker pads, but not the top of the head, and must visibly connect with tracings to the ears. In kittens, tracings may not yet be visible. No white hairs in the points. Mask sh ould not extend over the top of the head (called a “hood”). 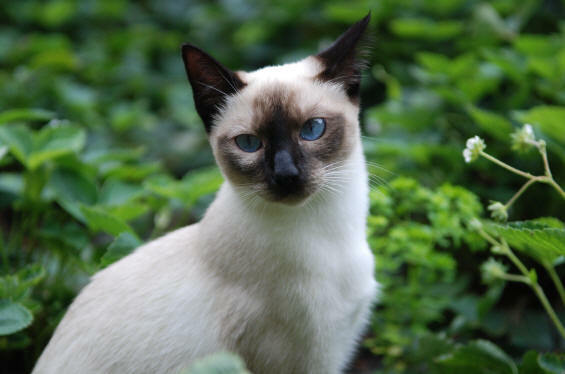 Original colors of the traditional Siamese are Seal-, Chocolate-, Blue- and Lilac point. Other colors are also allowed: Red- Crème-, Cinnamon-, Tabby and Tortie point. No ticking in the points, except as noted for lynx points. Upper lid shaped like half an almond (out lengthwise) and lower lid a fully rounded curve. Outer corners set very slightly higher than inner corners. At least the width of one eye between eyes. Neither totally round, narrow, or slanted. Medium in size, in proportion to the size of the head. Neither totally round, narrow or slanted. Color must be luminous, vivid blue. Uncrossed. Head is medium sized in proportion to the body. It is a medium- to large boned modified wedge that is somewhat longer than wide. The sides of the head, especially the muscula r lower jaws, appear slightly to moderately rounded, but the muscle is distinctly wedge shaped with rounded tip. The muscle mass of the jaws should always be in proportion to that of the rest of the body, with allowance made for stud jaws. Profile somewhat elongated from the eyes to the top of the skull, medium length from the eyes to the tip of the muzzle, in proportion with the size of the cat. There is a slight dip in the nose just below the eyes, a gentle, gradual rise from the dip to just above the eyes and a slight convex bend that marks the beginning of the forehead. The forehead is flat to slightly convex. The tip of the nose lines with the tip of the chin in the same vertical plane. Solid chin. Ears medium in size, broad at the base and rounded at the tips. Ears set as much on the sides of the head as on the top. Hair on the back of the ears very short and close-lying, velvet in texture, leather may show through. Inside hair to be left natural length. Very slight ear tufts to be allowed. Healthy, athletic physical condition. Eyes clear. Muscular, strong, substantial, yet lithe. Neither flabby, bony, nor fat. Kinked tail (visible or invisible (can only be felt). White toes and / or feet. Any evidence of use of drugs to alter the appearance or disposition of the cat.